I once sat in a meeting at a decidedly omnichannel brand ... one that the pundits would stand up and heartily applaud. We got to the point in the meeting where the marketing department had to make a presentation. The presentation could have taken all of five minutes. The presentation took more than an hour. As the Executive Team listened to the presentation, components of the marketing team were brought in and out of the meeting. The email team came in to talk about their part of a promotional strategy. The social team came in and talked about #engagement, not mentioning profitability (which caused the CFO to writhe uncomfortably). Creative entered the room to speak about visual merchandising in stores, a presentation style that would "inspire our heritage". "Anybody can do that job." 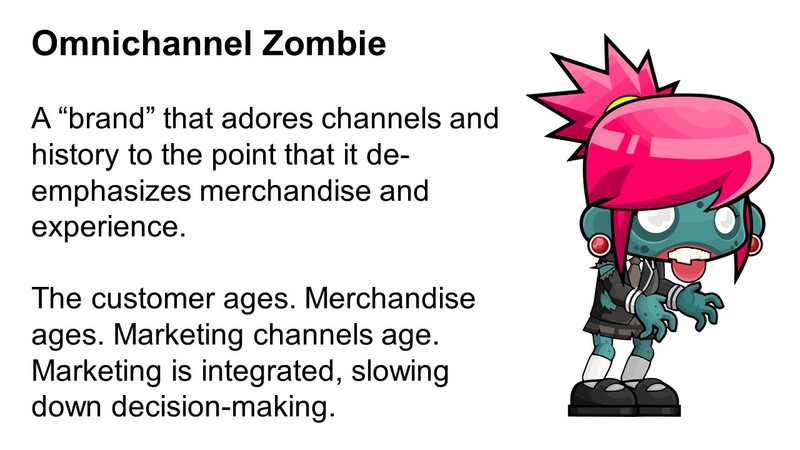 Every company - even those that are not "omnichannel brands" - every company possesses elements of the "Omnichannel Zombie" brand attribute. Some call this "red tape" or "bureaucracy". But in modern retailing and e-commerce, this brand attribute became toxic. For the past decade, too many of us wanted to move into the future by holding on to the past. Catalogers were first - demanding that print be used to drive customers online. 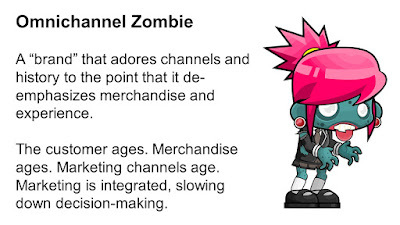 Retailers were next - demanding that the online channel first serve stores and then when that didn't work terribly well we abandoned stores to grow online resulting in store closures which ultimately hurt online traffic. We tried to protect old-school channels by demanding that new channels caused old-school channels to succeed. This strategy appealed to loyal buyers. This strategy didn't bring on new customers ... younger customers. This strategy caused the merchandise assortment to skew much older, which also drove away younger customers. Worst of all - this strategy slowed down decision making ... to a crawl. You can barely put out an email campaign this Thursday without making sure that 129 employees are happy that the campaign serves nine different masters. It must drive sales in a store. It must have a "viral component". It must convert customers online. When it drives a customer to a cart and then the cart is abandoned, we have to chase the customer all across the internet with an integrated omnichannel message ... which is of course impossible so we do the only thing we know how to do ... offer 40% off plus free shipping ... which pulls the customer further away from a store. Those of use who have too much of this attribute in 2018 will have to nurture one of the remaining five attributes going forward, in order to compensate for the problems caused by being an Omichannel Zombie.